A friend of mine just had a baby (number three for her), so I am thinking baby gifts… So what are the top three gifts I recommend for a new mother then, from the Norwex catalogue? Surprised? Okay, I know you thought I’d say my book here didn’t you? But it’s not from the Norwex catalogue, and anyway, let’s not overwhelm the new mum with too much information yet! Just start with getting her laundry clean, without coating her clothes and her baby’s nappies with toxic chemicals. Did you know most Australian laundry powder is up to 1/3 fillers? Which can coat both your clothes AND washing machine? 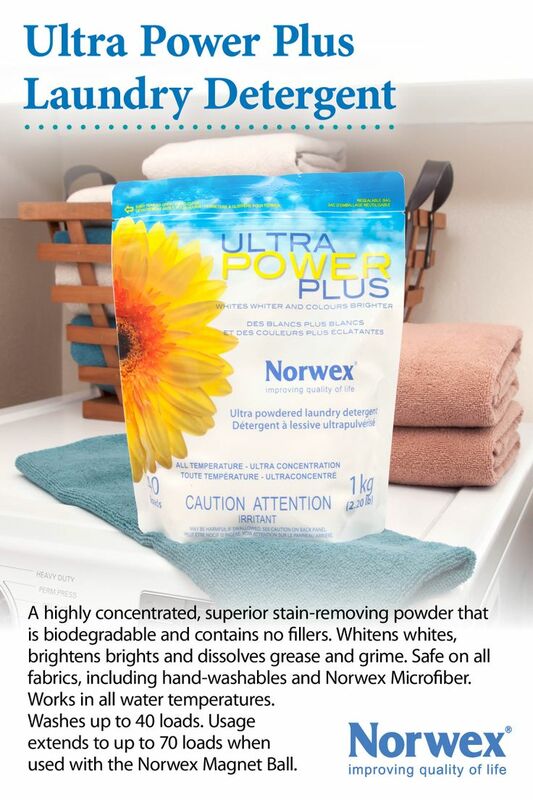 When you start using the Norwex Ultra Power Plus washing powder, I actually recommend doing a machine wash, with a scoop of the powder, a cup of vinegar, and an old cloth nappy or other rag. You’d be surprised how often that rag can come out covered in gunk that has come out of the washing machine pipes. But it’s not just the fillers. The dyes, artifical fragrances and other chemicals can also be left in your clothes. Did I mention endocryne disruptors? Personally I don’t want my baby’s developing hormone system disrupted! I have also had several customers switch to using Norwex washing powder because they or their kids get eczema, and conventional laundry detergents all make it worse. When they switch to using Ultra Power Plus their skin settles down again. Yes, I am talking in the present tense even though my youngest baby is now almost five! That’s because even five year olds (and eight year olds, and twelve year olds, and okay yes, mothers too) can be grots. Basically, I use these like wipes, but with no nasty chemicals, and no land fill effect. No fragrance, no alcohol, no chucking them in landfill. If I still had very small children I would probably keep one or two damp in a ziplock bag, in my nappy bag. Not so much for cleaning up bottoms (they are perfect for that too, but using re-usable bottom wipes when you are out and about takes a certain sort of person, and she probably already has her own! ), but for cleaning hands and faces. These days, I just keep them dry, because I don’t need them as often, and wet them from my water bottle as needed. Surprised you again didn’t I? So why the mop? Well think about it. That baby is going to be crawling around on the floor in no time, which means that mama (or dada) is going to be sweeping and perhaps washing that floor a LOT. Did you know that there is generally a higher pesticide content in household dust than in soil, and that pesticides indoors take a lot longer to break down than they do outdoors? (source – PDF) And it’s not just chemicals tracked in from outside that end up in dust. Phthalates and other toxic chemicals from cleaners, new furniture (often a lot of that around with a new baby), plastics, even air fresheners all concentrate in dust (another source). I actually love the norwex mop more for the dry mopping system than the wet. That’s not because the wet isn’t awesome (it is), it’s because I dry mop (aka sweep) my floor almost daily. I only wet mop it… well, not so often. The Norwex dry superior mop fibre picks up dust, dog hair, cat hair etc using a static charge (which is just there naturally in the fabric, you don’t need to do anything to it), as well as up to 99% of the bacteria and germs, because of it’s super high quality microfibre. You will still have stuff you need to sweep into the corner into a pile and pick up with a dust pan (or just an envirocloth), but nowhere near as much. Because of the adjustable handle, you also don’t need to bend when you are using the Norwex mop, so it is far easier on your back than a conventional mop or broom, which is awesome for a new mum or dad, who is already carrying around a baby (not to mention what pregnancy does to your back!). Sometime I will do a full review of the Norwex mop, but in the meantime let me just say, if you do buy it – for yourself or a friend – make sure you get shown how to use it. There are some good videos on this, or you can get a consultant to come into your house and show you (assuming you then buy it from them too, or have a party with them). Here’s a great video on it. Also the best way to buy it is in a kit, unless you get the wet mop as a host gift (it is almost always in the host gifts) when you hold a party, in which case, just buy the dry mop fibre that suits you. Where do you buy all these lovely gifts? Well, of course, if you are in Australia you can buy them through my website., or if you’re in New Zealand you can buy them here. You can also get lots of them FREE though, by having a party! And that way you also get shown how they all work. If you’re in Canberra, I can run that for you, or I can do one for you on facebook if you’re elsewhere in Australia. If you want an in-home demo and you’re not in Canberra, I can probably recommend someone for you, or you can plug your postcode in here to find someone local. Right, over to you – what is the best baby shower gift you’ve recieved or given? If you have kids, looking back, what do you think you would have liked, or what do you wish you’d been given back at the beginning? **It doesn’t make my top three list in Australia, because we are not big clothes dryer uses, but if your new mum is using cloth nappies, I would chuck in a set of wool dryer balls too. They will reduce the drying time by around 25% and soften the nappies naturally (even if you wanted to use fabric softener with all it’s nasties, if you it on cloth nappies it will make them less absorbent). I’ve waxed lyrical about them more here. ← Would You Like to Start Your Own Norwex Business in Australia or New Zealand? Oh, I love organic stuff so much. I think these idea of yours is smart! It’s great to gift something that is good for the baby; safe and useful. You’re very welcome Sarah – what was the idea?